CONDO ON VANDERBILT BEACH with LARGE VIEWS of GULF OF MEXICO - LARGE POOL - REMODELED. OUR only COMPETITION - Raggata Condo is 800 yards from beach (with $400-500 of fees not shown) in daily rate. Check fees in detail. They have No Private Beach Access, only Public beach 40 yards wide (crowded). - SO NO CROWDS from PUBLIC PEOPLE ON BEACH. - REMODELED New Furniture/Linen & Beach chairs etc. 2ND PRIVATE BEACH is at Our House on Beach (300 yards away). - See PICTURES and MOVIES to see this. - No Other Condo Can Offer This!! - SEE PICTURES SHOWING VIEWS. SEE our 3 BEDROOM HOUSE on CANAL #336460 - PRIVATE BEACH ACCESS - NOBODY ELSE HAS THIS Because WE OWN Another HOUSE ON BEACH. ACCESS - so its very quiet. - See this on our web site below. Our Private Beach Access is TOTALLY PRIVATE & QUIET - No Condos or Public Beach Near by. See it on our web site. NaplesLuxuryRentals.Net. - All others are 30 day minimum rental. GREAT GOLF AVAILABLE AT FIVE PRIVATE CLUBS. Nobody else can offer this deal because we are members. COMPLETELY REMODELED - New Furniture - Tile floors, bathrooms shower tile/hardware, all fixtures, appliances, etc. Linen replaced each year with 600 thread count sheet/pillows etc. LARGEST SWIMMING POOL (30' X 60') ON VANDERBILT BAY FOR GREAT VIEWS AS BOATS GO BY. NEWEST BUILDING ON VANDERBILT BEACH - Larger kitchen, concrete walls so its quiet, large lot around building and large pool right on Vanderbilt bay. Gulf Views & Bay Views from our unit. 70% LESS THAN RITZ-CARLTON OR LAPLAYA HOTELS - AND BETTER QUALITY. BEACH CHAIRS, UMBRELLA'S, TOWELS, COOLERS - CART TO CARRY EVERYTHING. All Private Golf clubs in Naples do not allow non-members to play their course – because of high demand. Call for more information. We are members at 5 clubs. Golf equipment available to use for free. OUR CONDO IS CLEAN CLEAN CLEAN. GREAT RITZ-CARLTON HOTEL ALTERNATIVE. Same quality as Ritz Carlton and Laplaya Resort Hotel. We are closer to the beach, five times the space, new furniture & remodeled, and just as clean - 70% LESS the price of the Ritz or LaPlaya. ONLY WEEKLY RENTAL on Vanderbilt Beach because all other buildings must rent 30 day minimum because of Condo Association laws of their building. NEW MOVIES of Private beach access, Private Beach, Inside/outside of condo & Aerial from helicopter showing area. Wiggin State Park movie as well, send me email for help seeing these movies. CLOSEST BUILDING TO BEACH, SHORT WALK (70 yards) TO BEACH. WATCH the SUNSETS FROM OUR LANIA, or sit at the POOL ON VANDERBILT BAY TO WATCH BOAT TRAFFIC. All NEW APPLIANCES: Washer/Dryer, Refrigerator, Dishwasher, Micro Wave, Oven, Hot Water Heater, Air Conditioning and wall pictures. NEW COMBINATION DOOR LOCKS, GATE LOCKS - so no keys to worry about. NEW AIR CONDITIONING, PICTURES (15), paint, drapes in all rooms, fans and wood trim. NEW FLAT SCREEN TV's HD (3 total) DVD and WiFi. HBO/ShowTime & 150 channels with Recordable HD/Comcast. NEW BATHROOM ON THE BEACH with outdoor showers, across the street from our Condo - Very Convenient !! WIGGENS STATE PARK – MOVIES AVAILABLE (80 yards away) which provides 1 mile long beach, totally undeveloped so it’s quiet and no crowds. Cooking allowed on the BBQ's Grills provided on beach. Just Walk down to where the Dolphins come in at sunrise & sunset at (Wiggins Pass). NO CROWDS AT OUR POOL OR BBQ HUT, so it's Very Quite. The Regatta has 100 weekly rental units, so it's very busy/loud hotel environment. NEWEST BUILDING on the beach (except for two high end buildings with 90 day rentals) so we have concrete 6" walls so it’s QUIET. Large kitchens. MASTER BEDROOM: King bed, 40' Flat Screen TV/HD and walk-in closet. DEN/3RD BEDROOM: 1 Queen size sofa/foldout bed - sleeps 6 total. AIR MATTRESS 18” Deep, Queen Size for extra comfort. LIVING ROOM 50" TV/HD DVD RECORDABLE, HBO/SHOWTIME plus 150 channels. GREAT VIEWS at DAY or Night, Gulf of Mexico views, Vanderbilt Bay area and lights at night. BOAT RENTAL at WIGGINS STATE PARK 80 Yards away. BBQ & picnic tables on the beach inside Wiggins State Park for afternoon use of beach for diner etc. BEACH CHAIRS, Towels, Umbrella's with Cart available to carry to beach. Ritz-Carlton Hotel and La PLaya Resort Hotel a few hundred yards down the beach. Great diner and sunsets with appetizers. VANDERBILT LANDINGS IS A GATED DEVELOPMENT including locked private beach access. GRASS HUT (with picnic tables) great for an afternoon BBQ while you watch the boats go by. 1,600 square feet of living space, including two bedrooms, a den, two bathrooms, and a large screened-in lanai with storm shutters. KITCHEN FILL WITH POT/PANS and most all cooking items you need. All you have to do is show up and enjoy this great city and the beach. I think I have included most everything you'll need. Naples enjoys very temperate weather year-round, with winter temperatures consistently five degrees higher than in central Florida -- and often ten degrees higher than in northern Florida. Temperatures average in the 70's and low 80's in the winter months. The summer season, at this most highly sought-after international vacation destination, has equally desirable weather with highs in the 80's to low 90's, and is cooled by gentle Gulf breezes. Many other homes that you look at do not show their views because they don't have a good view. Most are filled with low quality K-Mart quality furniture, but we have HIGH QUALITY furniture. My wife is an Architect/Interior Designer so we know quality. I have been operating rental/vacation properties for myself in Naples for 12 years. I moved from Minneapolis, Mn where I rented other homes. The past renters have added suggestions for 12 years so I have it organized for a great vacation. I have been asked every questions so I hope I'm organized and have what you want while in Naples. I purchased a condo and then a house, in the best location on Vanderbilt beach with heated pools and all the beach chairs/coolers etc. needed to keep everybody happy and return next year. Before that I have been in real estate brokerage for 30+ years and for 12 years in naples, so I can help renters buy a house. Buying in the right location is the most important decision. Vanderbilt Beach is the best part of Naples and we have the newest building who can rent by the week, when others are all 30 day minimu. Naples is the best location in Florida. I researched other cities in Florida and Naples was a newly built city with new infrastructure which creates easy movement around the city. We have the most resturants and golf courses while still being a small town. Naples has attracted better people who want these things and all price ranges of homes can still take addvantage of theses benefits. Warm during the winter with a cool breeze off the Gulf of Mexico with newer buildings everywhere. This is the best city in America. Our condo is the newest building on Vanderbilt beach who can rent by the week(The timeshare can rent weekly, but its really old and small units). All other condos like Reggat are 800 yards from the beach with no views. So when I purchased this condo I asked others why they purchased here: They said 'quiet building because of its thick walls, great views over the Gulf, largest pool, and alot of space around the building' to enjoy BBQ/fishing/tennis and a short walk (75 yards) to the beach with a Private Beach Access. Gated Security and building security with 4 units per floor. Our unit is on the 6ths level for great views. Back of our building is on Vanderbilt bay which is access to the Gulf of Mexico. Thanks very much glad you enjoyed our condo. First time we rented this condo and we have been to Naples many times. We loved the location and view. Condo was very roomy and clean. We really liked the pool overlooking the causeway and watching the boats go by. Bocce and tennis courts were a nice addition. New grills near the patio. The beach access was close and we watched several sunsets there. Kitchen has all the utensils and newer appliances. Scott Sorenson was very helpful with access and questions. Will go back again. Thank you! 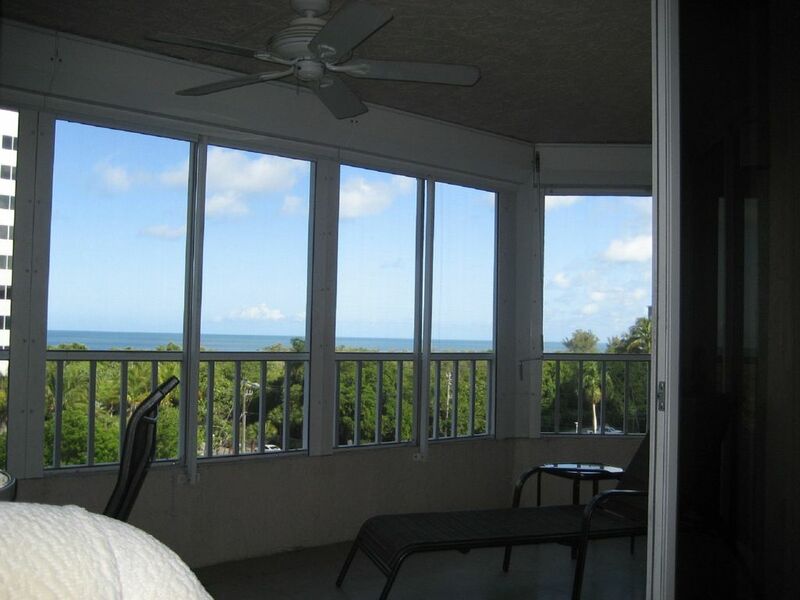 This is a very nice condo located just across from the ocean with a dedicated beach access. The unit is very clean and comfortable and has all of the amenities you would expect (e.g., WiFi, cooking supplies, in-unit laundry, etc.). The owner is extremely prompt in answering questions. I would highly recommend the unit. going to this condo for 3 years, but for us too return, Scott will have to put some time, and a few dollars in his investment.. Other than that we had a great time..
Richard thanks for your comments. We usually keep shutters down to keep lanai clean and the electrical control raisers them in 15 seconds. the clock on microwave will always need to be reset for many reasons. We never had a smell in unit so next time let me know because air conditioner is brand new and keeps air clean. Glad you enjoyed the condo and please come back again. Very nice, clean, updated condo—with a view of the Gulf! Easy walk to the beach. The condo had everything we needed for a fun week in Naples. A short walk to LaPlaya or Turtle Club for dinner. Thanks! Thanks we try to keep it in great shape. Location is the Best for Weekly rentals. We are the closest condo to the beach for weekly rentals. We are also the newest building on the beach, so it good to keep it in good shape so everyone really enjoys the condo and has a good vacation in Naples.